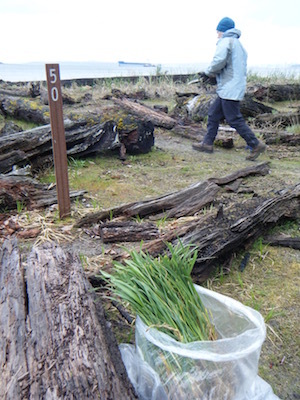 WWTA volunteers returned to Blake Island State Park for annual maintenance at the Cascadia Marine Trail campsite Saturday, April 8. They planted 1,500 dune grass starts and spiffed up the three tentsites for the coming season. Shout out to Paul Ruppert of Washington State Parks who transported volunteers by boat on a blustery day. The citizen evaluated and ranked WWRP Water Access Barnum Point purchase will not be funded under the State House of Representatives’ recent Capital Budget proposal which unfairly targeted and cut 15 WWRP acquisition projects. It was a top-ranked project that should have received funding under balanced funding allocation formula previously approved by the Legislature. This Island County property would create a 129 acre park with over a mile of PUBLIC shoreline. It’s the best mix of private, Whidbey Camano Land Trust, and public, Washington Wildlife and Recreation Program, funding. Stanwood High School students have donated $10,000. Call 800.562.6000 or email your Representatives and forcefully let then know that the integrity of the program should be respected, that Barnum Point and 14 other valuable acquisition projects should be fully restored to WWRP. Thank you to the thirty-nine WWTA donors who amassed $5,510 to be used as a 1:1 match for your generous 2017 GiveBig donations Wednesday, May 10th. More details coming soon. Welcome to Washington Water Trails Association, where the public’s right to access Washington’s waters is paramount. WWTA is your advocate, working to expand, protect, and steward Washington’s amazing aquatic natural resources. Check the calendar for upcoming events; spring is right around the corner.